Treliske student accommodation in Truro is a brand new development ideally situated for medical, nursing and dental students training at Treliske Hospital. Our student accommodation has double beds throughout and en-suite rooms available. 6 month contracts are also available. If you are looking for accommodation for a different length of time, please contact us directly to discuss your needs. You rent will be due in advance on a termly basis but other payment options may be available on request. Please get in touch with our team to discuss your needs further. Standard rooms are brilliant value and are fully furnished with a double bed and shared bathroom facilities. Treliske accommodation is located just outside of Truro, on the Royal Cornwall Hospital site. This brand new student accommodation boasts a stylish kitchen/lounge area and modern bedrooms with comfortable double beds. The student accommodation is available to students from the University of Plymouth who are working or studying on the Treliske Hospital site. If you're a nursing, dental or medical student, Treliske provides the perfect base for your training. With all-inclusive bills, free contents insurance and high-speed Wi-Fi and broadband, you can relax and focus on what's important. There's also an on-site laundry and secure electronic entry to the buildings. The brand-new complex consists of 232 rooms, 180 standard rooms with shared facilities and 52 en-suite. 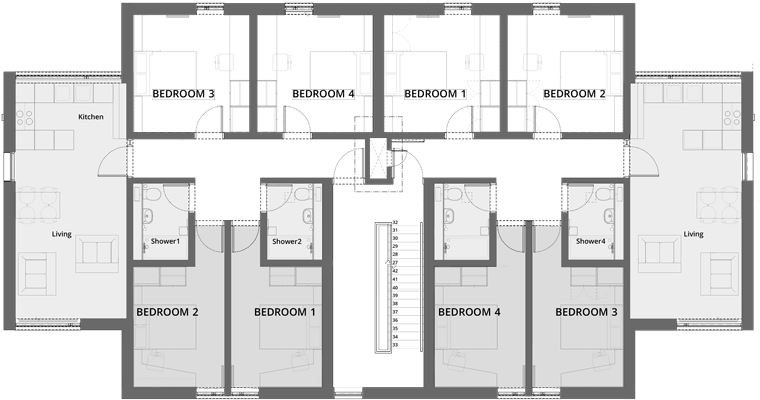 Divided over seven blocks, each block consists of eight flats, with three, four or five rooms per flat. Flats are fully fitted with modern furniture and appliances. If you're looking for modern, comfortable student accommodation and the opportunity to live with like-minded students, Treliske is the place for you. 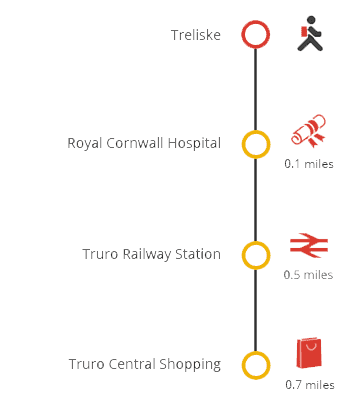 Treliske accommodation is just a short bus ride from Truro city centre, perfect for enjoying everything the local area has to offer. There's the famous Truro Cathedral, a great selection of bars and restaurants and a wide range of independent and high street shops. Don't miss the farmers market which is held every Wednesday and Saturday! Try Indaba for Cornwall's best seafood. Top bars include the independent Bunters, which hosts regular live music events, Zafiros for cocktails and party nights, and Vertigo for light bites and beers from around the world. Treliske is just a short walk from Truro golf course - but if golf's not your thing, you can visit Hall for Cornwall for great live music events, theatre and comedy, or the Plaza Cinema for all the latest film releases. If you want to venture further afield, you can visit some of the most famous attractions in the South West, including the Eden Project, Newquay's surfing beaches and the Tate Gallery in St. Ives. Applications for accommodation are managed by the University of Plymouth and we will work with the university to make you an offer. If you are studying through Plymouth University or the Plymouth University Peninsula School of Medicine and Dentistry, you will need to apply for accommodation once your course place is confirmed. To apply for accommodation, you need to complete the Treliske accommodation enquiry form. If you have individual requirements, please contact us to discuss them. You need to nominate a lead member of your group to make the initial booking. When the lead member books their room, they need to select specify that the booking is part of a group booking. The other members of the group will then have to specify the lead member’s name, during their booking process. KeySurf - Broadband at speeds up to 8Mb symmetric. You will also have the option to upgrade to a 20Mb or 50Mb service. You can collect your keys from the day your contract starts. On arrival you will need to go to the office. You will be required to sign a copy of your licence agreement and have a photo taken for your ID/entry card. You will also need to bring ID and a copy of your offer letter or email, along with a payment receipt. You will need to pay your first instalment before you can check in. To avoid delays, this can be paid online at any time prior to your arrival at the residence. Once check in is completed you will be given the keys to your room. We do not provide any bedding or crockery so please bring these along with you. Alternatively there are stores in the area which sell homewares. An area to park and unload your belongings will be available. Because of limited parking space you will be asked to move any vehicle once you have unloaded. To cancel your acceptance of our offer you must speak to our on-site team or call us on 0870 600 4777 at least seven days before the start date of your licence. If you cancel your acceptance at least seven days before the start date of your licence you will be entitled to a refund of your reservation fee, but not your administration fee. If you accept an offer within seven days of the start date of your licence the reservation fee is not refundable. If you do not notify us of your cancellation of your acceptance you will not be entitled to a refund of your reservation fee. If you cancel your acceptance before the start date of your licence any licence fee paid to us will be refunded. If the start date of your licence has passed and you have moved into the room you cannot cancel your acceptance and may be responsible for the payment of the licence fee until the end of your licence. Please see your licence agreement for more details on refunds and how to end your licence once you have moved in. For more information and to buy your licence, visit TV Licensing. There are a variety of payment plans available. Treliske now benefits from LaundryView which will make doing your laundry on-site even easier. The system, created by Circuit, allows you to go online and check the availability of washers and dryers in your building as well as see when other washes are about to end. This summary does not describe all the terms and conditions of the policy and does not form the contract between you and the insurance provider, so please take the time to read the policy wording on the Cover4Students website to make sure you understand the cover it provides. Limited parking spaces are available to rent from Q-Park Ltd.